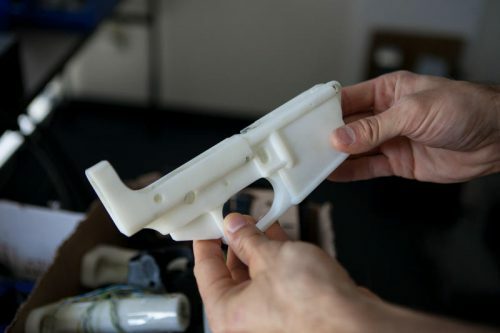 Austin-based firm Defense Distributed published designs over the weekend for 3D-printable guns that can be fabricated at home and would be virtually untraceable. So far, hundreds have downloaded the files, but a handful of attorneys general are seeking to block the firm’s ability to post the designs online. Cody Wilson, the founder of Defense Distributed, tweeted that he has filed lawsuits to dismiss the challenges in New Jersey, Los Angeles and Washington state. The publication of the files comes after a three-year legal battle between Defense Distributed and the State Department. In 2013, Wilson published designs for a single-shot pistol that could be 3D printed out of plastic and fabricated with easily accessible metal parts. The State Department said the files were in violation of federal arms export rules and ordered Defense Distributed to take them down. Wilson sued the government on First and Second Amendment grounds. This year, the State Department finally settled the lawsuit with Defense Distributed, carving out an exception in the arms export rules and clearing the way for the company to publish the files on Aug. 1. Yesterday, 21 state attorneys general sent a letter to the State Department and U.S. Attorney General Jeff Sessions, urging them to withdraw from the settlement. U.S. Rep. David Cicilline (D-Rhode Island) and U.S. Rep. Seth Moulton (D-Mass.) also filed a bill yesterday to effectively outlaw the production of 3D-printed guns. If passed, the bill would reclassify the firearms under federal law and undo the State Department exemption. This week President Donald Trump seemed to indicate opposition to Defense Distributed’s publication of the designs on Twitter. At least some of the files Defense Distributed released this week have been available on the internet in some form for years, mostly on filesharing sites. Last week, the Brady Campaign to Prevent Gun Violence and other gun control advocates filed a motion to prevent the publication of the designs. A federal judge denied that request. Update: A federal judge in Seattle has issued a temporary restraining order stopping the designs for 3D-printable guns from being posted online. This entry was posted in KRTS News, KXWT News and tagged 3D Printing, guns, texas. Bookmark the permalink.